They say that time is money, so why not let the bill ring up right in front of your eyes with the Bring TIM! time management clock? 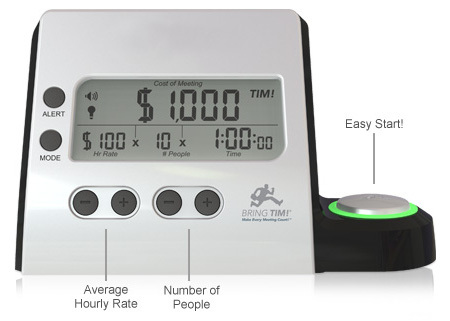 After all, this unique timepiece will display the total cost of everyone’s time with each second that passes by, and once the cost is clearly displayed and impressed upon people’s minds, all discussions are supposed to become brief, topical and productive. Of course, it could have the other effect of prolonging a meeting simply because people attending it are too puffed up in their heads that they think they’re worth so much. Doubling up as an office clock, this makes a great gift to any boss! Bring TIM! retails for $24.99 a pop.